This past week, Portland received approximately 5.5 inches of rain in just a few hours. Obviously, when I see the reports from more southern states, I realize we really had it pretty easy here. And my thoughts are with people of South Carolina. But during one of those hours of intense heavy rain here, just as the deluge was beginning, I was getting my hair cut. My lovely stylist and I laughed as the rain began to ping against the windows. He gave me my one and only blow drying of the year. And then we laughed about putting my raincoat hood up, as though that was somehow going to protect my fabulous hair from the now faucet-like rain. And then he gave me advice about how to navigate around the large two foot deep puddle between the door of the salon and my car. Turns out, I was in flood central, and as I attempted to leave the area and get home, only two miles away, I kept getting turned away from intersections that were in the process of flooding. And being turned away seemed to mean that I was following the water flow, and kept ending up in flood central all over again. Thirty minutes later and I was still about three blocks from where I began. I came through this intersection right behind a City of Portland truck that had just arrived...to shut the intersection down. This picture was taken a little less than an hour after I came through it. Anyhoo, I won't go into too much detail about the rest of my drive home, and just how high the water was on my minivan doors, in case my mother reads this. She might take away my license. But when I got home, water was pouring in the windows at the house, those that had been missed as we hurried off to school that morning. Meanwhile the river was rising. Fast. And we had left the kayaks down the bank on the dock, the moveable steps folded down into the water. The water was lapping at the kayaks already and I heaved up the stairwell that folds down into the river, pulled on the kayaks, now completely full of water, and immovable. And headed back, completely soaked, to pick up the kids from school. It was insane, that short trip across town. This time I knew to keep to the high roads, and the modern non-cobblestone, for example, roads. And I took a long and circuitous route that involved the Turnpike and the high off ramps to get to school. I made it. Returning home by the same path, I apologized to Nicholas and told him about the rising river. He took it in stride. Changed his clothes and shoes. And Elliott with a bucket and Nicholas with his 14 year old muscles and I returned to the river. Elliott bailed the kayaks and Nicholas and I hauled them up the bank to safety. Jonathan and the kids took this video of the falls later the same afternoon. Two days later, I was curious about just what had happened on my little trail across the river that I walk often. In general, the water had receded. But in the low areas, there is a layer of silt, dried river sludge, and dust everywhere. On the banks, if you look closely, the water rose about three feet and the brush shows high water marks in dusty grey stripes. 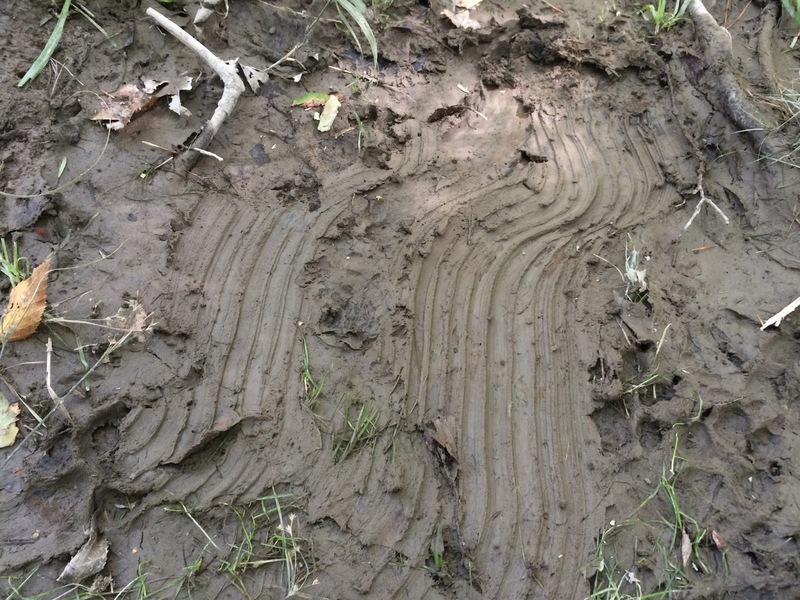 Yes, indeed, I did slip in the mud and land on my backside to get that close up of the animal tracks. Despite the turmoil down there in the previous days, it was still beautiful. And the sun was out. And it was all recovering. As it does. Things are getting back to normal. How impossible it all seems now.